Don't put up with skateboard, in-line skates and bicycle damage anymore. 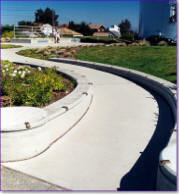 SkateBlock™, the pioneer in eliminating damage caused by skateboards, in-line skates and bicycles, manufactures patent-awarded cast metal devices that protect planters, walls, benches, handrails, and other architectural features. 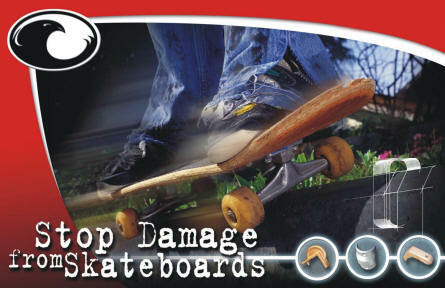 Skateboards, in-line skates and bicycles cause hundreds of thousands of dollars in property damage every year. This damage reduces your property's functionality and can increase liability to property owners who become responsible for the injuries caused to innocent third parties. SkateBlock™, deters skateboarders, in-line skaters and bicyclists from "grinding" on your property...without impacting the intended use or beauty of your property. 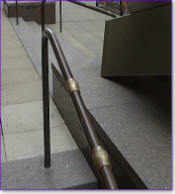 Best of all, SkateBlock™, only requires a one-time cost and are "on duty"